Exhibition starts on Tuesday August 18 - 27 September. 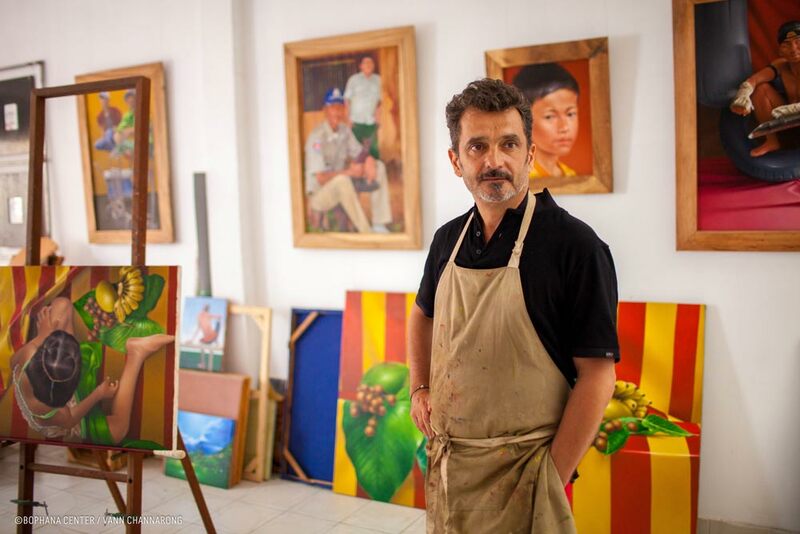 After exhibiting in France, Spain, China and America, Ricardo Casal, a nomadic artist, opened his workshop in Phnom Penh in 2012. Since then, he has continued his creation while conducting artistic projects with local artists and partners. In 2012, he realized a project entitled “90 Khmer Figures” in homage to King Norodom Sihanouk, in collaboration with a team of young artists of the Royal University of Fine Arts and with the support of the KHMERNEXT Foundation. The time has now come for Ricardo Casal to present the work he has been creating during his stay in Cambodia. On this occasion, and to highlight the vitality of contemporary Cambodian creation, he has given seven young Cambodian artists the opportunity to join his project “Crossed views on Cambodia”. The Bophana Center, as a Cambodian and international cultural center, is the ideal place for Ricardo Casal and these young artists to present to the public their crossed views on Cambodia in this shared exhibition. The young featuring artists are: Im Pesey, Sou Kimsan, Thun Dina, Nhem Sopheap, Seng Visal, Tep Chanty and Tola Morm, all of whom have recently graduated from the Royal Academy of Fine Arts in Phnom Penh. The exhibition is supported by the foundation KHMERNEXT.